By far the best guitar amp sim/plugin I own. Great sound. For lovers of rock, blues, folk - this is the perfect option. Very pleased with the purchase. I think this amp is more for crunch. I've been looking for a nice amp sim for a while. I've tried quality sims before (incl. vintage amp). That Friedman is perfect to me (blues/soft rock) - I play with a Gibson es 390 and it sounds perfect. 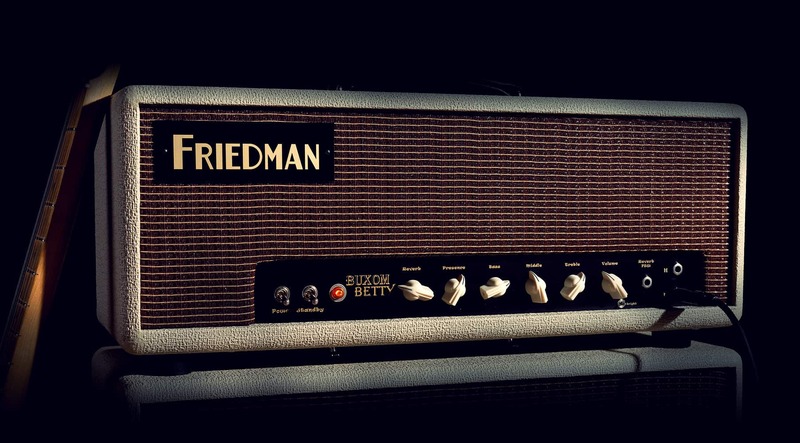 I use the Friedman Buxom Betty Amp Simulation for Blues Recording and nothing sounds better. It is a very good alternative to my Fender Twin Reverb but it´s easy to use and you do not need to place a microphone in front of the Amp. I use a Rupert Neve RNDI to record the raw signal of the guitar. Easy, fast in use and great sounding, i am very pleased with this Plugin. I use multiple guitar amp simulations. Friedman Buxom Betty is nice. Not better or worse than others (even from other manufacturers). It's another type of sound on the "guitar" palette. Very dynamic. I use quite often - from pure to distorted "voice" of guitars. Try it yourself. The Cab emulations are superb and offers a huge amount of options for your tone. You can get lost in the forest of functions. As I guitarist I've been thru every amp sim ever made, hardware or software. This MAY not be the ultimate best, but then again it might just be the overall best. Such a variety of crystal clear tones, OD, Crunch, Lead,with an actually musical sounding gate. Delay built-in. The sickest combination of cabs and multi-mics I've ever seen. No longer corralled by either the Brit Plexi type sound, American Fender blackfaces and their various iterations or the scolding cold scream of some modern day transistor technology. Maybe the only thing difficult to coax from this sim is Fender tweed-but who doesn't have a dozen other ways to do that?? Absolutely an excellent amp sim. This might be the most flexible amp sim I own. (I'm not positive, just bought it 3 hours ago and haven't been able switchover to another sim to get a reality check! I've so many Marshall and Fender iterations, its a blessing to get a set of different tones. Add a very smooth sounding noise gate, a delay, and the variety of top shelf mics, cabs, and pre's used to capture the amp sound, I'd have to say it's going to be quite a few compositions before I go back to a Marshal Plexi or a blackface Fender. This amp sim is the shizz! Crank the mids, put your favourite OD front, pipe in some sparkle or 'verb from on the inserts - this has kept me from turning on my actual amp in some time. Love these models...keep 'em coming! One of the better sounding versatile Amp Sims, IMO. I demoed, read & watched a lot of reviews about the UAD Friedman Buxom Betty. Even though I have not heard the real amp first hand, I found this to be one the most versatile and realistic amp simulation plugins for my style of playing. Having this in the Unison slot is icing on the cake and provides a lot of no latency enjoyment. Given a second chance, I would skip this one. I like the tweed much better. On it's own, I can't really see using the Friedman. Mixed with the tweed, it is okay. I will probably opt for the Suhr over this one. Just my opinion, others seem to like it. Great sounding plugin!!! Beautiful Tonage!!!! I would just like to add that I now HAVE tried situating the Buxom Betty in a real-band, full mix, and it fared exceptionally well. I am genuinely excited about this tool. I am a working guitarist and am simply not a fan of amp sims. My experience isn't all that wide, but I have spent time with many UA models including the ballyhoo'd tweed, I spent enough time with a Kemper and an Axe FX to turn away in disgust, and of course have on occasion reached for Amplitube and Guitar Rig models for a laugh. Oh yeah, and I had a Pod 2.0 years ago. For reference, my current gigging amps are a Gries 35 (blackface clone) and as a backup a Reverend Hellhound 60/40. The '64 Princeton Reverb is probably my holy grail amp. I am not a roots player, something more like "progressive pop" tho I do plenty of soloing. Enough about me. I have NEVER been moved by an amp sim as I have by my first 30m with this one. Really lovely, thrtee dimensional tone and touch responsiveness better than any I have experienced in a model (again there are many I haven't tried, and it seems like maybe that has been an area of improvement in the modeling field overall). Seems super versatile within limits that are fine by me. it is time to start taking Brainworx very very seriously. Caveat: Haven't tried situating it yet in a full, real-band mix, and that is a traditional point of failure for sims, IMO. But AS A PRACTICE AMP ALONE (yes, I have an Apollo) this thing is a game changer for me and I am hopeful and optimistic about how it is going to fare as a real world tracking tool. As I suggested above, I am 30 minutes into my 14 day demo and reaching for my wallet. This amp keeps me from buying a Kemper. Even though I love to take time and experiment with sounds, as a music producer, sometimes you have to get things done quickly. This amp emulation is perfect for that but also gives you tools to get creative. As sin as you plug your guitar it sounds great. However, you have a ton of tonal possibilities with different mics, pres, EQ's, cabs, etc. Is the perfect tool for a great tone and keep you work flow going. Its sou great sounding that I have stall my intention of spending 2k on a Kemper.